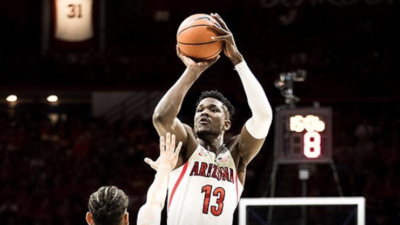 As the best pure center of this draft, Ayton has probably secured the #1 spot, above all if Phoenix gets lucky in the lottery. In this mock draft, I took into account teams’ needs to offer the realest projection. Ayton dominated the Pac 12. He’s the best pure center and has incredible skills for someone with his size and athleticism. He can shoot, has post up moves and will finish at the rim whenever he can. I have to confess he’s not my favourite prospect as he’s not the rim protector he should be and didn’t prevent Arizona from losing against #13 seed Buffalo in the first round of the Tournament. He has 7 games under 50% FG this year. Memphis needs virtually players everywhere on the court and may go with the best player available. A potential face up four with incredible length, Bamba wasn’t as efficient on offense as Ayton or Bagley. Yet, his 10.5rbds, 3.7blks and developing jumper may make him a better long term prospect. A lot of room to develop into an excellent two way player in the League. Atlanta already has a rising power forward and has to chose the best player available. If this draft wasn’t so stacked with big men, Doncic would go number one. Some scouts may put Porter Jr before but as of now, his 60 minutes of play are not enough to put him above the Slovenian jewel. People talk about Doncic’ relative lack of athleticism, but watching a 19 years old dominate the Euroleague ranking with Real Madrid has never been seen before. Doncic can shoot, has a very high basketball IQ and solid body at 6-8 225. He plays with and against former NBA players and displays incredible maturity which makes him a sure thing in the League. With Ayton, Bagley has been the most dominant inside player this year. The Duke freshman still has room to improve on his shooting and above all defense. He may be the safest pick but lacks Ayton or Bamba’s length. Dallas needs an offensive threat inside and Bagley would fit perfectly to improve Dallas’ roster. Teams needs may make Jackson Jr slip. He was inconsistent at the end of the year but his combination of size, shot blocking and shooting could be very helpful for the Kings. Jackson Jr is young and may end up one of the best players of this draft within three years. Rebounding, defense, shooting, Carter is a versatile player who fits well the new mold of centers. He didn’t have a good Tournament with 0 3pt made and only 2rbds in the loss against Kansas. Yet, at the 7th spot, he would complement well Love and Thompson and he’s as good inside as he’s from outside. A good output in the Cavaliers’ roster. The Knicks have promising young players at almost every position except at the small forward. Michael Porter’s stock is still high, but I haven’t seen enough to put him in the top three. Porter Jr has just played 53min this year and may need some time to get back to his old athleticism. Yet, he was the top high school player last year and a potential star at the small forward spot. His workouts between now and the draft will determine where he’ll be picked. The Bulls are pretty talented, what they lack is a good small forward and Kevin Knox may be that guy. A bit raw, Knox has to improve on many fields like his shooting consistency, passing or being a more efficient defender. He’s one of the most talented players entering this draft but he will have to work hard to reach his full potential. The Sixers may go local with Mikal Bridges. The Villanova swingman brings versatility, shooting and defense to a revamped Sixers team. He still has work to do on his handling but fits well alongside Fultz and Simmons. Clippers needs an efficient and skilled power forward. Bridges is not an academic player. He has a low release, could improve his handling, but at the end of the day, he brings shooting, athleticism, even passing and could be a glue guy for the Clippers. Williams has incredible body and athleticism. he was one of the best defender in the NCAA with more than 9rbds and 2blks in only 25min and may bring more toughness to the Clippers. He has to work on his outside shooting to play the PF spot or else will be forced to be a pure defensive inside player. I’m not a fan of Sexton. I confess he has heart but is a bit of a ball hog and doesn’t have elite size or athleticism for the League. Denver has been searching for a solid PG for years and has played with Jamal Murray as the main ball handler recently. Sexton could be an upgrade if he learns the nuances of the game. Another player I’m not a fan of. Despite his upside as an athletic shooting guard, Walker has a lot of work to do on his shooting and consistency He’s far from being a complete combo guard now and hopefully won’t regret his decision to enter the draft. He seems to be a smart kid, he will have room with the Suns to improve. Nobody has him as a first rounder but the WVU center could be the surprise in June. Konate is an incredible rim protector with 3+blks and 7+rbds per game and a promising shooter with almost 80% FT. Gortat is getting older and could be a good mentor for the young throwback center who would start his pro career in the same team as a former player he could look up to, Ben Wallace. After Ayton, the Suns could draft another inside player. The duo of Chriss and Bender have been useless since they have been drafted (14pts 9.7rbds 1.6blks in 46 min combined this year) and the younger Porter’s package of shooting, shot blocking and basketball IQ could allow him to gun for the PF spot. Mitchell Robinson is the unknown prospect of this draft. Since his senior season of high school last year, he hasn’t played, decommitting from Western Kentucky in the process. Yet, in high school, he was one of the top centers in the nation with very good running and leaping ability for someone his size. We’ll see if he decides to do the pre draft camps or focus only on teams’ workouts. He could learn the game from Lopez and be Chicago’s future rim protector. This draft is stacked with big men from top to bottom and even in the mid-late first round, teams could find interesting prospects. Bitadze is the best European big men his generation. He’s pretty mobile, averages 7rbds and 2blks in a pro league and is also working on his outside shot. He’s foul prone and still has room to improve but he could be another Nurkic for the Hawks. Through the ups and downs, Duval has been able to showcase during the Tournament, despite an awful 1/7 FG game against Syracuse, that he was able to shoot it from outside. Duval is a polarizing prospect who could become a starter in the League as he could be out of it if he doesn’t improve on his shooting consistency and decison making. Another mystery in this draft, Wiley hasn’t played his year because of his suspension by the NCAA. In a few months last year, he was able to show signs of dominance inside thanks to his strength and activity. He is an old school center who do his damages in the paint. He could be a reach at this point but if he stays healthy, would be the perfect complement to the softer Aldridge. The Jazz hit a homerun in the last draft with Donovan Mitchell. As the rookie sensation often acts as the primary ball handler, Trent’s shooting could be a nice fit alongside him. Trent may not be an athletic freak, but he’s one of, if not the most, consistent shooter in this draft despite hs youth. With Cory Joseph possibly searching for a more lucrative deal this summer, Brunson would be a perfect fit as Collison’s back up PG. He is exactly the type of player Indiana loves, a mature, poised leader who has been successful in his college career, both collectively and individually. Despite his lack of size and athleticism, Brunson was one of the most effective player on offense and is set to have a long carrer in the League. A local kid, Brown brings versatility in a team stacked with role players (8 players between 15 and 25min per game). The Blazers could try to get rid of Turner’s fat contract and use Brown as the same versatile swingman. Like Turner, Brown is not the most athletic or the best shooting player but at least he has time to develop and could be an efficient addition at a low price pretty quickly. After Bridges, the Sixers could be interested in another local kid. Spellman, despite being 21, was very efficient as a freshman and, above all, is exactly what the NBA teams are searching as a shot blocking/rebounding/shooting big man (8rbds 1.5blk 43% from three). The Celtics and Smart were not able to find an agreement last summer. The Celts may let Smart go and use the tough and athletic Smith from the bench. For the moment, the Raider is more an athletic swingman who brings intensity on defense. Yet, he has shown signs to become an efficient shooter (40% but only 18 shots made) and passer (1.8as for 1to per game). He benefited from a good Tournament where he shot 50% from three and had a breakout game against Florida with 18pts 9rbds and 7as for only one to. The Nets found their center of the future last year with Allen in the late first round, they may find their PF of the future with Penava. The Bosnian is not as mainstream as other PF prospects like Wagner but his combination of defense, passing and developing shooting are worth the risk as a late first rounder. His last game against WVU with 18pts 6rbds 6as with 2/2 from three are a good illustration of what the collegiate top shot blocker can do. 18pts 6as and 5rbds in three games during the Tournament have propelled Martin and his brother Caleb to potential first rounders. Cody brings versatility on offense and defense which could complement well the Warriors’ trio of shooters. Despite his age, Martin still has room to improve on his shooting but will be efficient from day one. The French combo guard is flying under the radar but he has the tools to be an efficient solution at both backcourt spots for the Hawks. At 6-4 with a 6-7 wingspan, he has played as the primary ball handler in the tough French championship and has adapted very well to his new position, while improving on his shooting (4.8as, 39% 3pt). Previous Previous post: Go Gilas! Could the Philippines become Asia’s superpower?